Feed My Heart! is not your typical romance tale to see who hooks up with whom - although - there is a love story. Feed My Heart! is not a mystery to rush to the end to see who done it - however, it features a marvelous hero. Feed My Heart! is not a book of poetry - but bits of verse, rap and song are together keeping hearts warm & strong. Feed My Heart! is not a daily journal - however, there are methods helping you stretch and reach to better your best. Feed My Heart! 5 Ways to feed your heart good today, tomorrow and always. Feed My Heart! has been a labor of love. 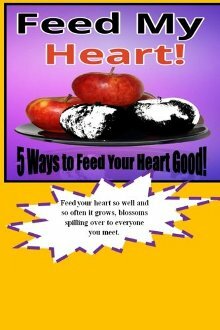 The five distinct ways to feed hearts good collectively will warm, nurture and empower hearts forever! "Thank you for all you do! You are so awesome! As a new Author, you have been so instrumental in getting my work out for a large volume of people to see. Always professional, helpful and understanding, my thanks to you, humanmade.net"